Ceramic tile is made from clay which is then glazed and baked into hard tile. It can withstand both high heat and cold, and can therefore be placed in nearly any room. 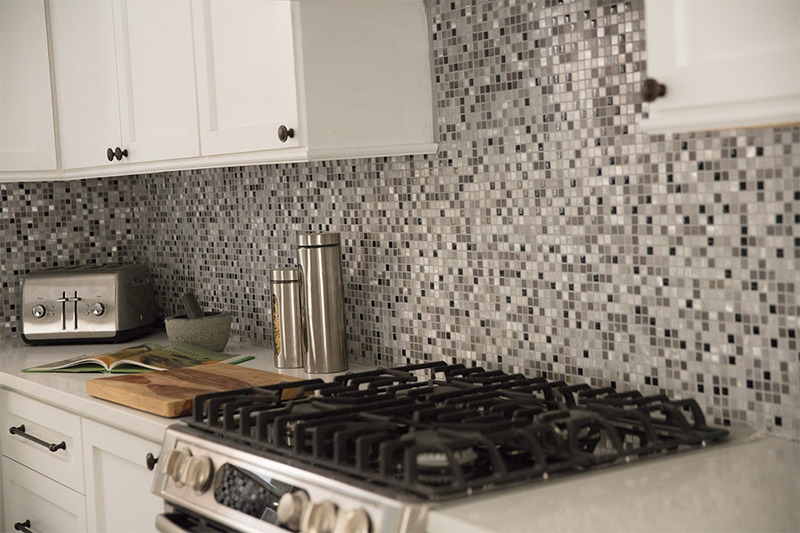 Ceramic tile is easy to clean and keep sanitary, making it a very popular material for use in both kitchen counters and backsplashes. However, this long-lasting material makes wonderful flooring as well. 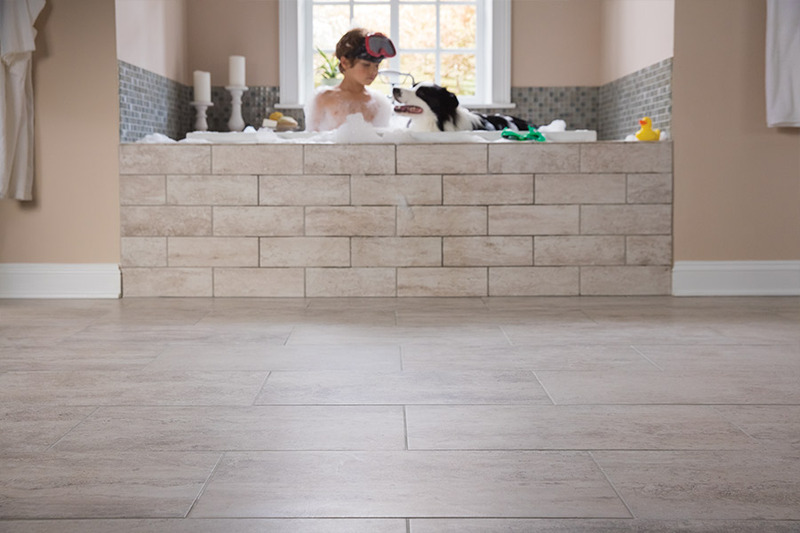 Unlike some other flooring materials, it is suitable for damp areas like the bathroom or laundry room because it is not at all affected by moisture. Ceramic tile is also a great choice for use in outdoor areas to make patios and porches more aesthetically pleasing. If properly grouted with a high-quality product, your floors will last for decades and require very little effort on your part to regularly maintain. 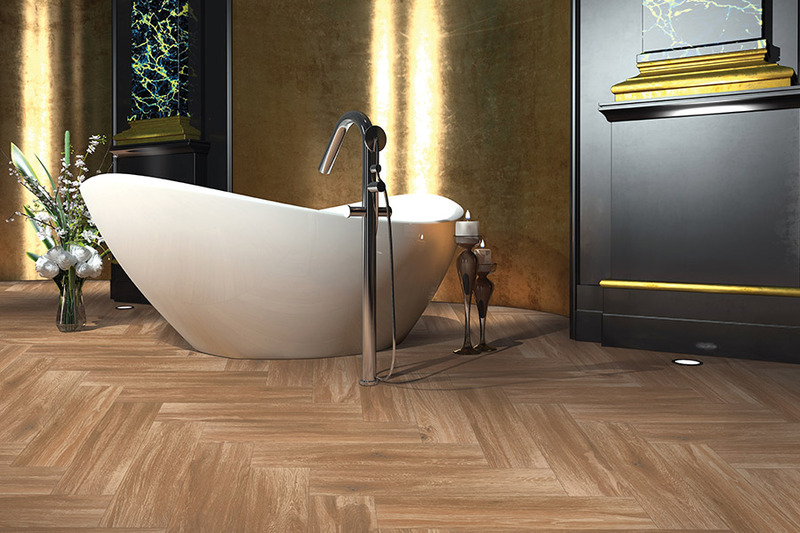 Porcelain is a type of ceramic tile that is available in wood-looks and large formats. Natural stone tile is somewhat different from ceramic tile. First, instead of being made from clay, it is directly mined from the earth itself. Natural stone tile includes marble, granite, limestone, and travertine. Each of these stones has a different use in the home. 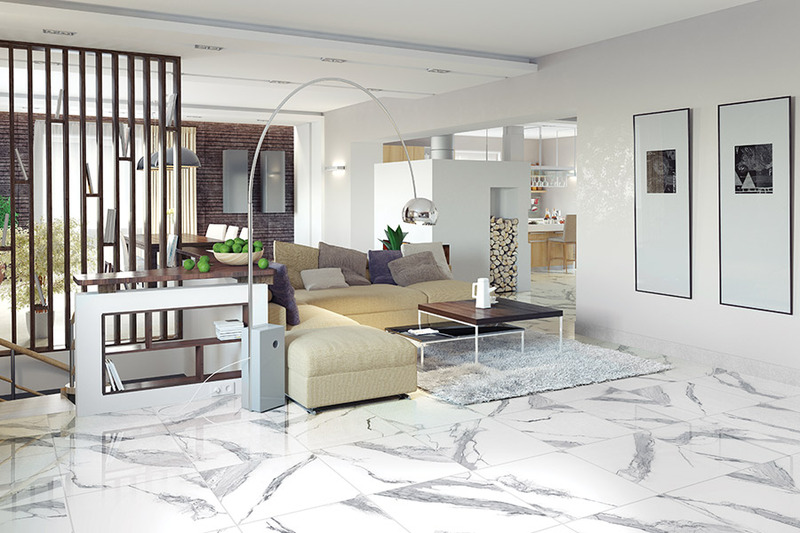 For example, marble isn‘t well suited for damp locations or high traffic home areas. It is the softest of the natural stone materials and the most luxurious as well, so it necessitates special sealing for protection. Granite, on the other hand, is one of the hardest materials following right after diamonds. It is a popular choice for flooring in most home areas, provided that it has been properly sealed. It is also usually a long-lasting choice. Travertine is quite frequently used for pool surrounds and shower walls because it is highly resistant to absorbing moisture and offers more traction to prevent slipping. Regardless of which of these natural stone products you choose, it will surely prove to be a gorgeous and utilitarian choice. Glass tile has a variety of practical uses. For one thing, it can be included with other kinds of tile to create an eye-catching mosaic on your home’s floors or walls. As with travertine, glass tile can easily be used in a shower or pool. Nevertheless, it is not recommended for shower flooring because it will be slippery when it gets wet. Glass tile is frequently used for backsplashes, or as an attention getter on walls, floors, and countertops. It will never fade due to exposure to direct sunlight, or become damaged by dirt and water. This makes glass tile it a good choice for outdoor applications. Ocala Carpet & Tile supplies and installs all types of tile for homeowners in Ocala, Silver Springs, Belleview, Dunnellon, Williston and other nearby Florida areas. We have a huge variety of tiles in stock in a myriad of different sizes. If you would like more information about tile products, or to actually view samples of these materials at your convenience, please phone us, e-mail us, or drop by at out Ocala showroom to discuss your interest in tile materials with one of our experienced home remodeling consultants.